Welcome to Day 3 of our Summer Sensory Fun Series! 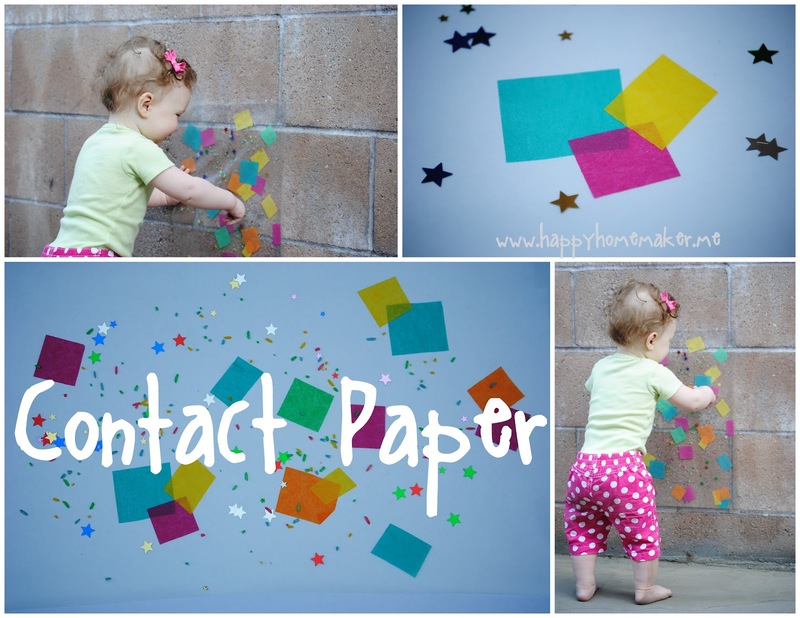 Today, I'm going to show you how to entertain your kiddos with contact paper. Kids love tactile activities. They love touching things that give them new and different experiences, and sticky is definitely a fun and new experience! Little ones will giggle with delight when their fingers stick to the clear plastic, and older kids will quickly get into the challenge of seeing what patterns they can create and finding a variety of materials that they can use. One of the best parts about contact paper is that since it's clear, you have a great way to display their artwork--from the non-sticky side. I used to have my students decorate contact paper with pretty tissue paper colors and then I would stick the contact paper to the windows--instant stained glass! It looks so pretty and festive from the outside, and brings in gorgeous brightly colored light to cheer up a room. During holidays, you can use holiday-themed colors, or make collages from themed magazines, or have the kids make mosaic images using construction paper...let your creativity go wild! You can use just about any mostly-flat material you can think of. For mine, I just used things that were in my Summer Sensory Fun Box, such as tissue paper, sequins, and rice. Kayleigh is too young to help out with an activity like this, but it is ideal for toddlers/preschoolers who no longer put things in their mouths. Even though Kayleigh wasn't able to make it with me, it has still provided her with hours of entertainment--she loves to look at hers, touch the pretty colors, and pull herself up to be near it. 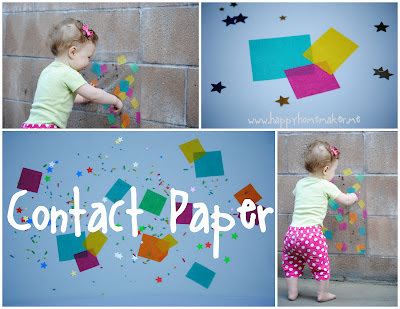 The easiest way to do this activity is to cut a piece of contact paper to your chosen size (I cut about about an 18 inch strip) peel the paper backing off, and tape it to the ground or a table sticky-side up. Provide your kid with the chosen materials, and encourage them to leave about a 1 inch border all the way around so that you can use the border to mount their artwork later. Once your child has decorated to his heart's desire, take the contact paper and press it sticky-side down to a wall or window. Now it's time to stand back and admire! (And don't worry, the contact paper should come off of the wall/window smoothly and easily. It's not made to be as sticky as it used to be). Babies will love the stimulating colors and enjoy touching the completed project. It gives them something exciting to focus on, and you can point to colors and shapes and begin teaching them. Toddlers will love the sticky texture and the freedom that they can do this all by themselves. They don't have to wait for you to glue things down for them, and as long as you've prepared ahead of time and cut all of the tissue squares or set out anything else that they will need, you can give them free rein on this one. You can also turn this into an educational opportunity and show them what happens when you overlap a piece of blue tissue paper with a piece of yellow tissue paper. You can encourage them to try to make shape patterns (square, square, star) or color patterns (blue, red, green). They can also make shape pictures and do simple images such as a house, boat, or tree. Older Kids can really get into this! They can create intricate patterns with the paper and design beautiful stained glass windows that will be a pleasure to display. You can give them a pair of scissors and have them cut out their own shapes, and also give them more freedom in choosing what they put on their contact paper. Ask them what kinds of materials will stick well. Could they try a nature scene by using leaves, grass, and petals? Could they use fabric and make a quilt? Could they try colored sand or crayon shavings? It is so much fun to see what they come up with! What a cute idea, and an excellent way to work on those fine motor and hand-eye coordination skills. Pretty, too! Aww...what a great activity! So glad you linked this to Things I've Done Thursday!